Govt sets deadlines, revises budgets of 3 suspended projects which will also ease shortages in UP, Uttarakhand, Haryana, Rajasthan and Himachal. New Delhi: After more than four decades, the central government has revived plans to build three dams across the Yamuna to help ease water shortages in the national capital territory (NCT) and five neighbouring states over the next 25 years. The union water resources, river development and Ganga rejuvenation ministry has fixed new deadlines and revised budgets of three suspended multi-storage projects — Lakhwar, Kishau and Renukaji — in Uttarakhand and Himachal Pradesh. The projects were suspended at different stages since 1992 due to concerns over financial viability and environmental clearances from the basin states. With revised budgets and deadlines, the three will now cost approximately Rs 22,000 crore. The budget of each of the projects could be revised, but the 90:10 cost-sharing ratio between the Centre and the states will remain, said the ministry. With the national capital facing shortage of drinking water, especially in non-monsoon seasons, the ministry decided to revive these projects in a move that will also help the neighbouring states — Uttarakhand, Himachal Pradesh, Uttar Pradesh, Haryana, Rajasthan — to store water for irrigation, drinking and industrial use. “At least 16 per cent households in the capital still do not have access to piped water supply, according to the Economic Survey of Delhi 2017-18. Once these projects are completed, Delhi will receive 1.7 times the current water supply,” said a senior official at the National Mission for Clean Ganga (NMCG) who spoke on the condition of anonymity. Sources in the ministry said the NCT currently faces a deficit of 200 million gallons per day (MGD) of its total estimated demand of 1,113 MGD. 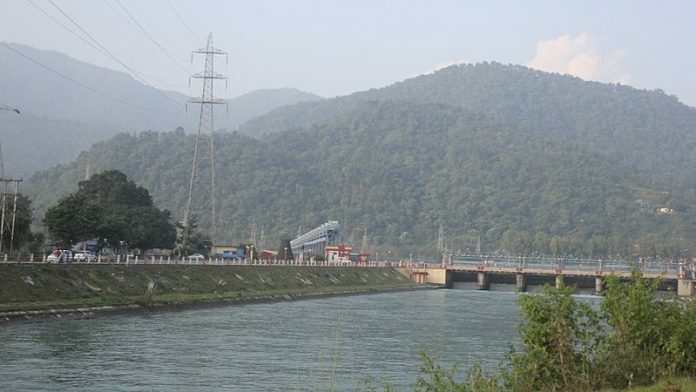 The 300-megawatt (MW) Lakhwar project involves the construction of a 204-metre concrete dam with a 40-km-long reservoir on the Yamuna near Lohari village in Dehradun. It will provide live storage of 330.66 million cubic metre (mcm) of water. The five states will get water as per their share of the cost upon completion of the project, entrusted to Uttarakhand Jal Vidyut Nigam Ltd (UJVN). Approximately 33,780 hectare land will be irrigated and 78.83 mcm water will be available for domestic, drinking and industrial use to all the basin states, said the ministry. The project was initially approved by the Planning Commission on 9 January 1976. Construction started 11 years later but was suspended in 1992 due to a shortage of funds. The cost of the project was about Rs 1,400 crore, according to estimates as on March 1996, but the beneficiary states fell short of adequate funds even when their share was 10 per cent. The project now has a four-year target completion date of December 2022. Another run-of-the-river scheme project on the Yamuna — Vyasi — is under construction in Dehradun by UJVN. The project is scheduled for commissioning by December 2019 with an estimated cost of about Rs 950 crore, said the ministry. The construction of the Lakhwar dam will begin after Vyasi dam is built. Both Lakhwar and Vyasi were initially planned together, but the two projects were split later. Once completed, the two dams will together supply 135 MGD of water to the national capital. The Kishau multi-purpose project will involve the construction of a 236-m-high concrete dam across Yamuna tributary Tons in Dehradun district with a live storage capacity of 1,324 mcm. Water stored in the Kishau reservoir will be utilised for irrigation, power generation and to augment drinking water supply to NCT and the five states. Construction of the dam was originally expected to begin in 2015 by UJVN. However, the approval was granted only last year. The project is now due for completion in 2023 at an approximate cost of Rs 12,000 crore, said the ministry. The Renukaji dam has been conceived as a storage project on Yamuna tributary Giri in Sirmour district, Himachal Pradesh. The project will see the construction of a 148-m-high rock-filled dam for the supply of 23 cumec water to Delhi. It will generate 40 MW of power during peak flow. Water from the Renukaji dam will be distributed to Delhi, Haryana, Rajasthan and Uttar Pradesh, said the ministry. The project, being constructed by Himachal Pradesh Power Corporation Limited (HPPCL) at an approximate cost of Rs 5,000 crore, has been declared a Project of National Importance. In the deep freeze since 1994 over cost-sharing issues, the project is now expected to be completed by 2029. “After completion of all these storage projects in Upper Yamuna Basin (including Lakhwar), the total benefits in terms of additional irrigation potential created will be 1,30,856 hectares, water availability for various uses will be 1,093.83 mcm and power generation capacity will be 1,060 MW for the NCT. The other basin states will also gain from it,” said NMCG executive director D.P. Mathuria.